Karen's Veggie Kitchen | Staying healthy and motivating others to become healthier through plant-strong food and healthy lifestyle choices. Good Morning! Are you wondering what to eat for dinner tonight? Don’t worry, I have you covered! 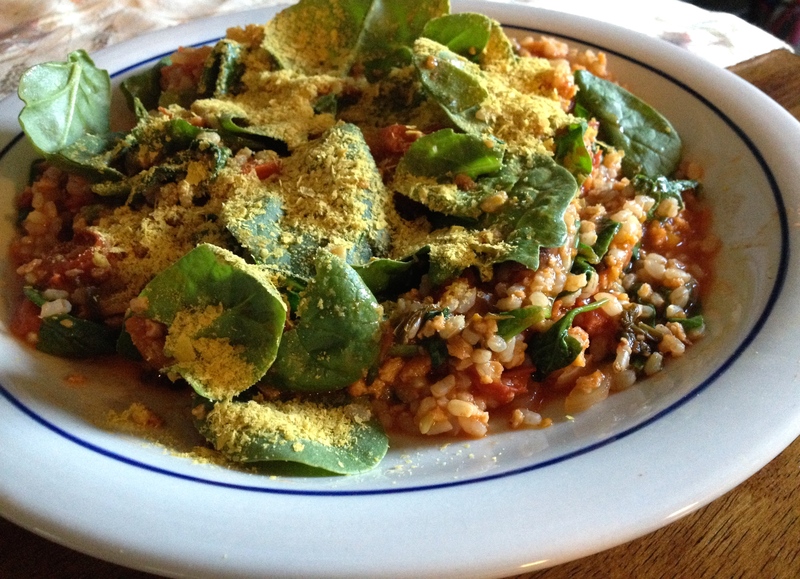 How about a yummy bowl of chunky tomato and spinach rice? Doesn’t that sound pretty good right now? It’s so easy to make, and it’s super comforting for the whole family after a busy day! Start cooking a batch of brown rice until rice is tender, about 35-40 minutes. While rice is cooking, heat up your Primavera sauce in a 5-quart saute pan. Heat, and bring to a slow simmer for about 10 minutes. Add the TVP and simmer slowly for 5 additional minutes. When rice is done cooking, add it to the Primavera sauce and stir to mix well. Add baby spinach leaves and stir until just slightly wilted. If you prefer your spinach softer, cook longer. 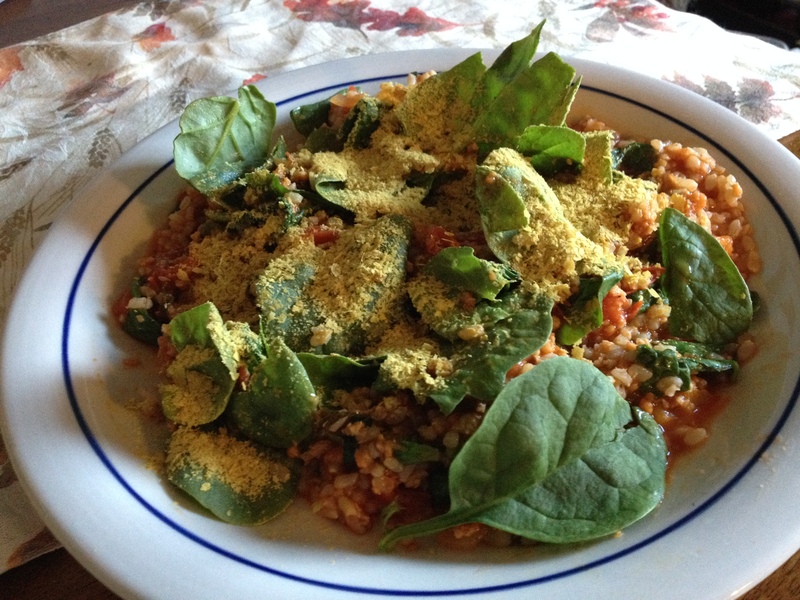 Serve immediately and sprinkle each serving with 1 to 2 tablespoons of nutritional yeast. It couldn’t be any easier to plantify your plate! It’s an easy clean up, it’s delicious and it’s a super nutritious meal your whole family will love! 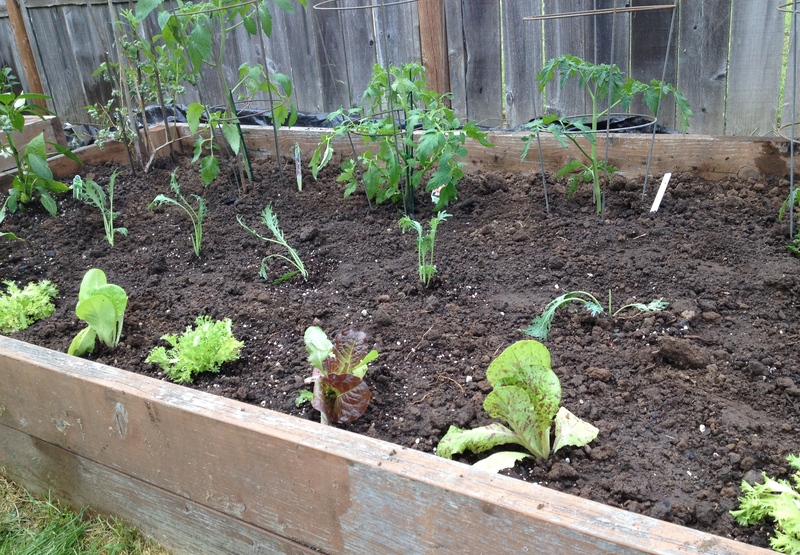 For Meatless Monday, there’s no better place to start than your own garden! First off, your food is fresher, you can control that your veggies will be 100% organic and you can’t beat the price. 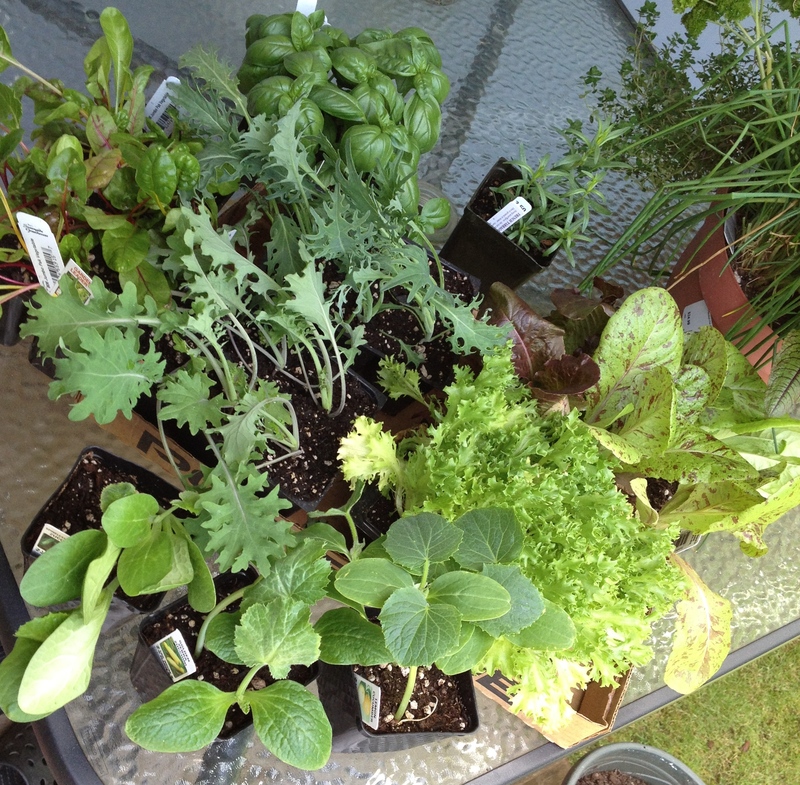 Take herbs for example, at $2 to $6 a package, growing herbs is a great place to start especially for the beginner. They’re easy to grow so you’ll have no reason to feel overwhelmed. With my shoulder not up to par I finally got my garden started this last weekend and to start things off, last Saturday I went out and picked up some of my favs which include Sweet Basil and Tarragon, two varieties of Kale, Rainbow Swiss Chard, two kinds of lettuce, yellow and green zucchini, and lemon cucumbers. 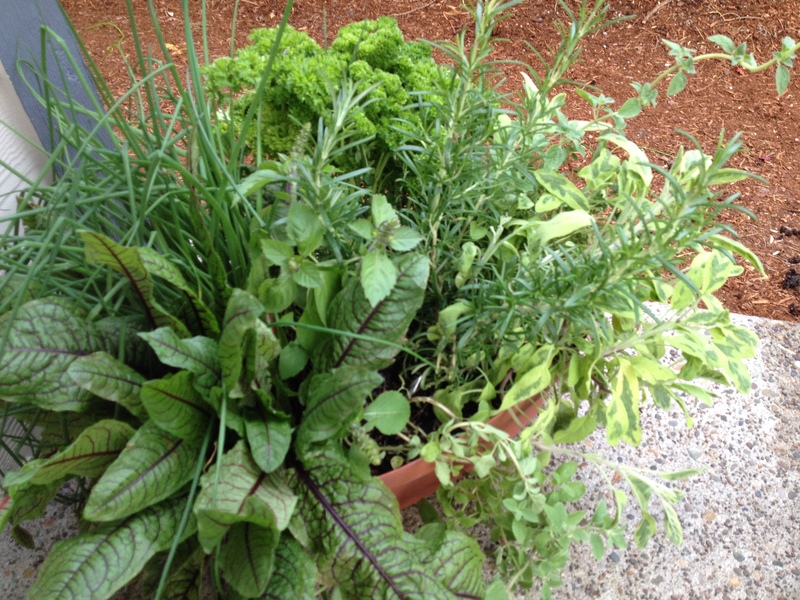 For Mother’s Day, my daughter gave me a beautiful mini planter which had a mixture of herbs — Rosemary, Basil, Sage, Chives, Oregano, Curly Parsley and a new one for me Blood Dock Red Sorrel– I love it in salads and soups. 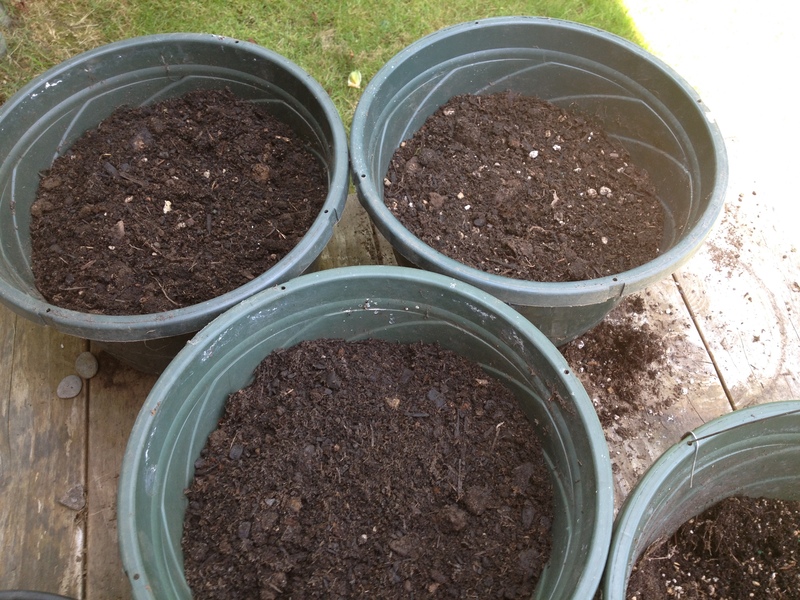 Boy did they take off, so I split them into three containers. When I started separating the plants, I found one Variegated Thyme plant that didn’t make it! So I was very glad I split them up into three containers. 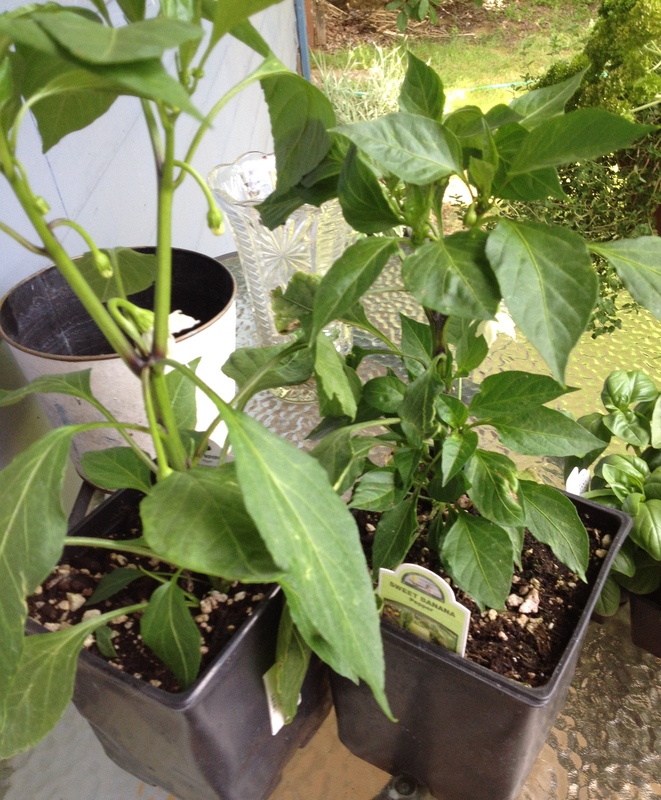 They are so pretty on my back deck and so handy for me to grab, rinse and toss into my veggie creations! Next, with the help from a good friend who is strong and still under the age of 20! (thank you Saylor!) 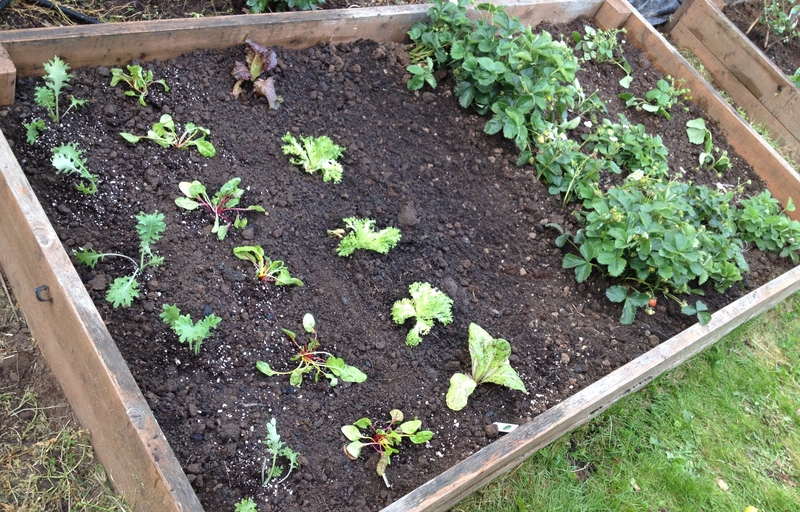 I got my raised garden beds turned over, and then added some new organic compost. 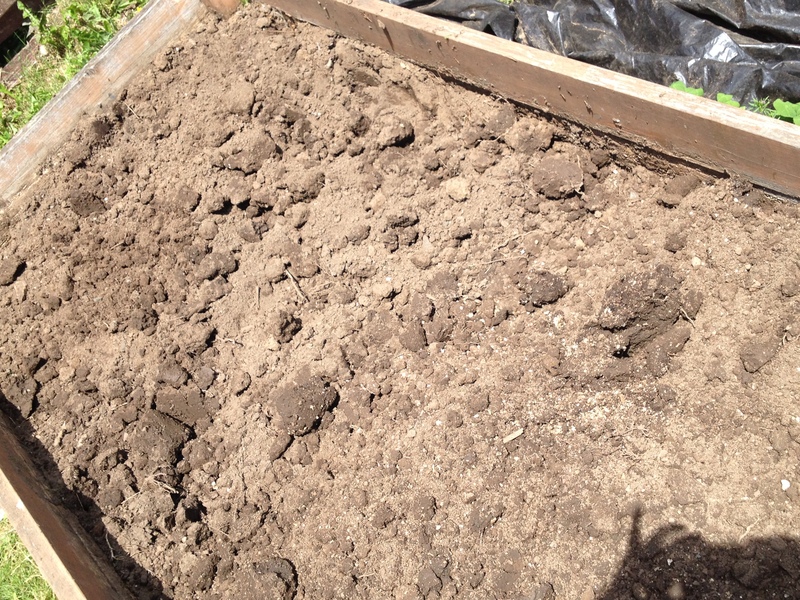 By Sunday, I was able to get down to the business of planting my first batch. 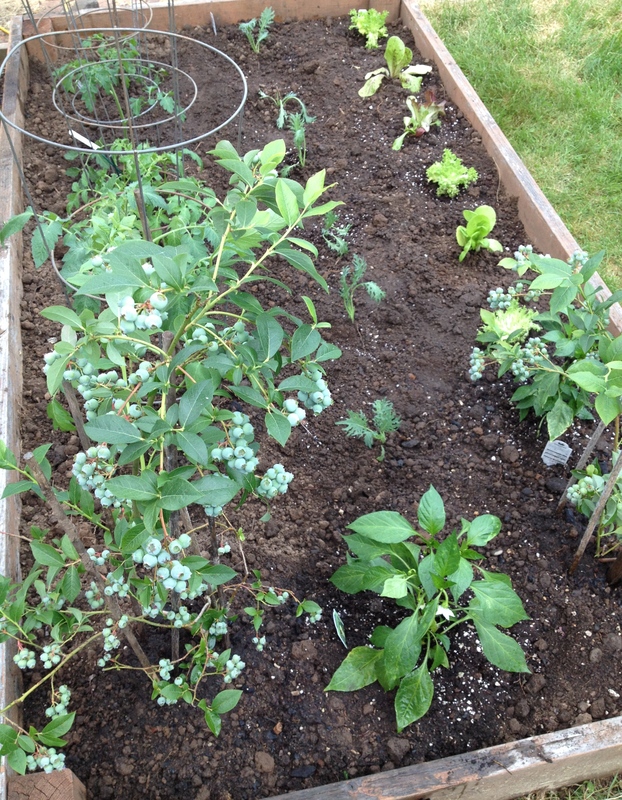 You can see that my blueberry plants have some nice looking berries. This is their third year, and I can’t wait to pick my first “real” crop. 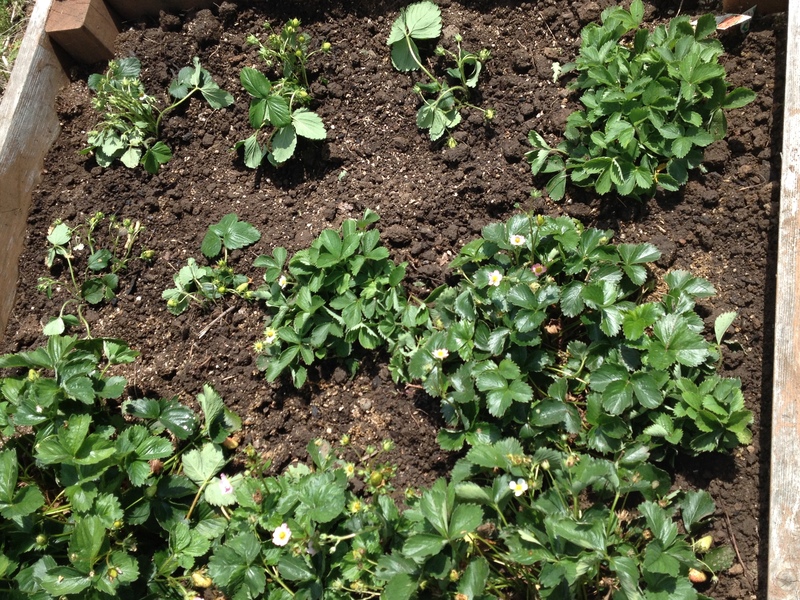 The strawberries look great too. I added a few new plants to round out the corner of this bed. 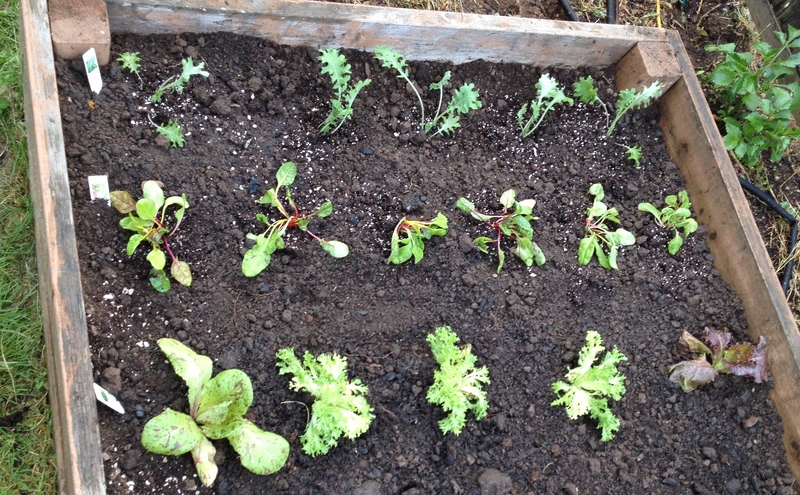 Lettuce and kale grow well with strawberries, and this weekend, I added the lemon cucumber plants to the middle row of the bed (cucs not pictured). My dad would be proud! 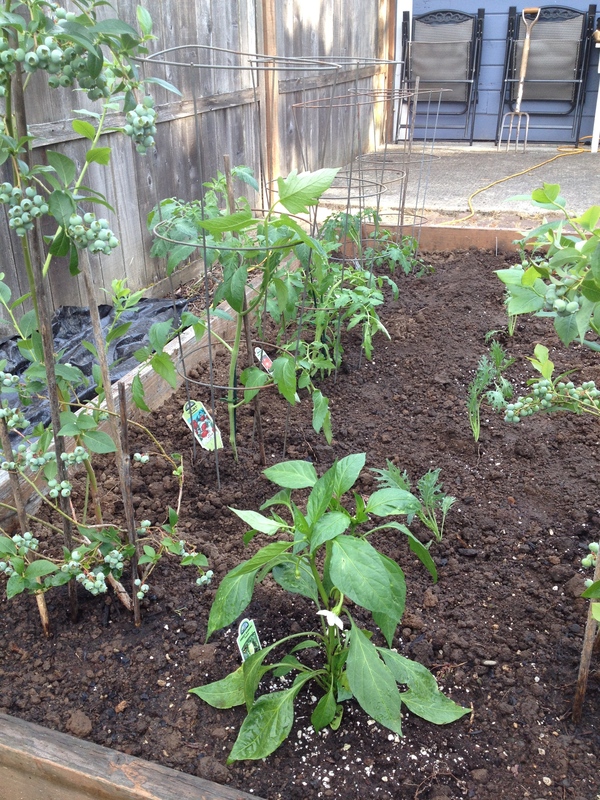 In a couple of weeks, I’ll be adding additional plants so I can have veggies coming on all through the summer. 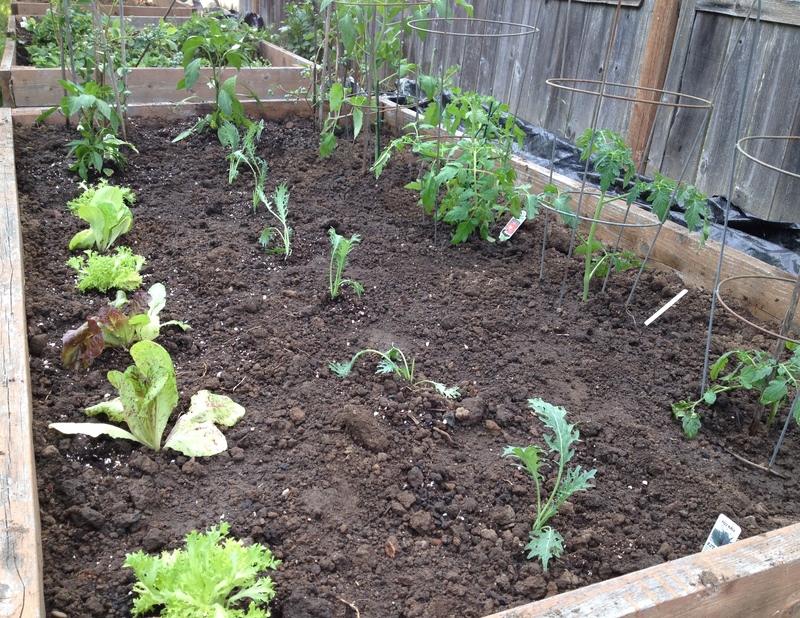 In the third bed (not pictured) I planted the zucchini plants. Those should be fun. Now, for a quick Meatless Monday treat …. 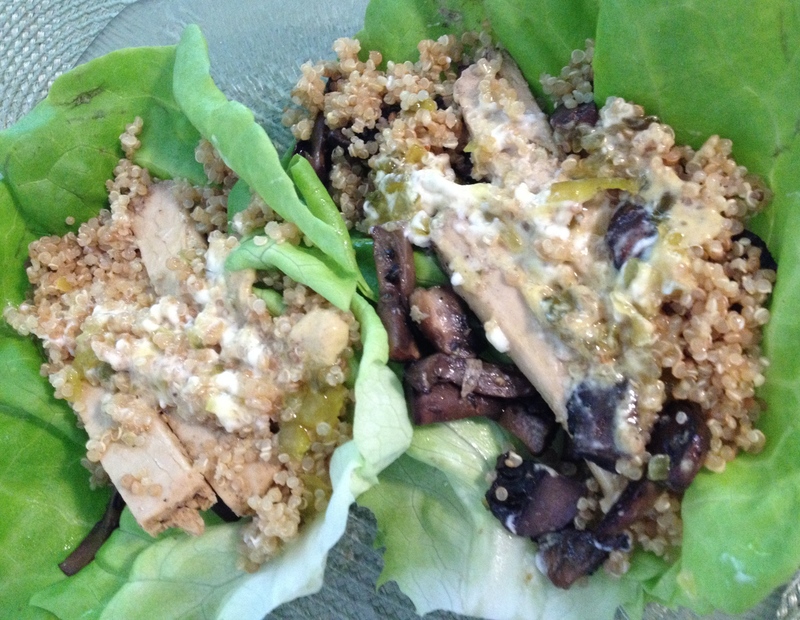 if you haven’t tried a lettuce wrap, you have got to try this simple wrap I just whipped up the other day. It’s so easy and you can make them with quinoa and tempeh strips … or … I’ve recently found a product when shopping at Natural Grocers in Eugene, OR called Beyond Chicken. It’s 100% plant protein made from NON-GMO soy and pea protein — a single 3 ounce serving has 20 grams of protein — and there are several flavors to try. My favorite is the Southwest Style Strips. Rinse and set to drain some Boston Lettuce leaves. The outside leaves are large and ruffly and make a perfect wrap. Cook up a batch of quinoa, and while that is cooking, saute (I used vegetable broth and Tamari sauce) 2 minced garlic cloves, 2 tablespoons minced chives, 1/2 medium sweet onion, chopped and 8 ounces of sliced mushrooms. Place sauted veggies into a 2-quart bowl. Next saute several strips of Beyond Chicken. If you like thicker slices serve each strip as it comes out of the package. I sliced them in half, lengthwise, and found them to be a perfect size for my lettuce wraps. Also, since quinoa is packed with protein, it wasn’t necessary to serve a 3-ounce serving size per person — so with this recipe it makes the package go farther! For a quick creamy sauce which can be made in advance: In a medium bowl, combine until blended: 1/2 cup Vegenaise with 1 tablespoon sweet pickle relish, 2 teaspoons of Dijon mustard with 2 tablespoons nutritional yeast. Cover and refrigerate until serving. Going meatless doesn’t mean you have to cut out the grill! In fact, this Memorial Day Meatless Monday, will be the perfect time to make some grilled veggies and bring out the tempeh which can be paired wonderfully with your grilled veggies, next to a wonderful salad, or eaten on a whole grain bun! I’ve found using a grilling pan or tray works best for veggies or tempeh on an outdoor grill – gas, charcoal, electric, or portable. These tools are awesome for two reasons: 1) veggies too easily fall through the grates on most grills; and 2) It makes it much easier to flip the veggies for even cooking. If you use a grill basket it flipping becomes a snap. So go for it! 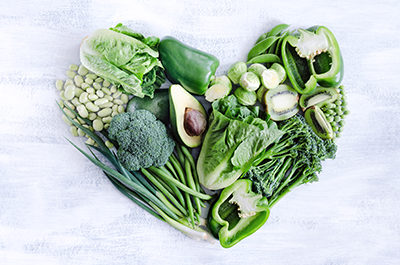 Pick up your favorite veggies today and enjoy! Preheat the outdoor grill for medium-high heat at least 30 minutes before cooking. 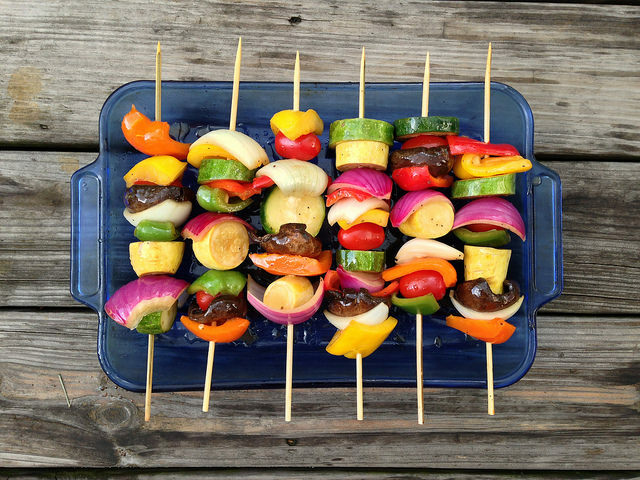 Take a grilling basket or grilling pan and fill it with your favorite sliced vegetables, or make vegetable skewers — mushrooms, onions, peppers, cherry tomatoes, zucchini, and summer squash all combine well, but get creative and go with the season. 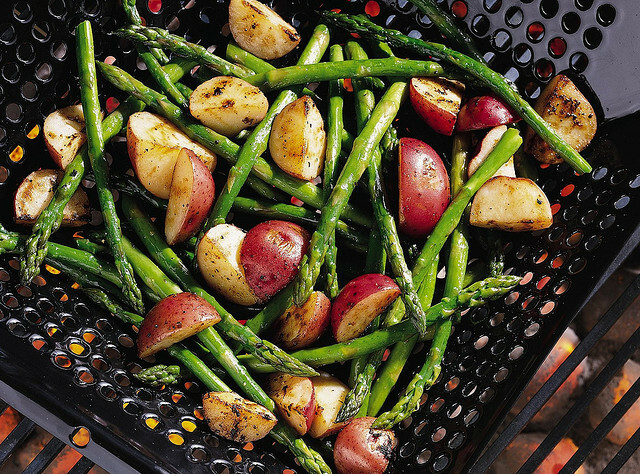 The beauty here is you don’t have to use oil to grill veggies! 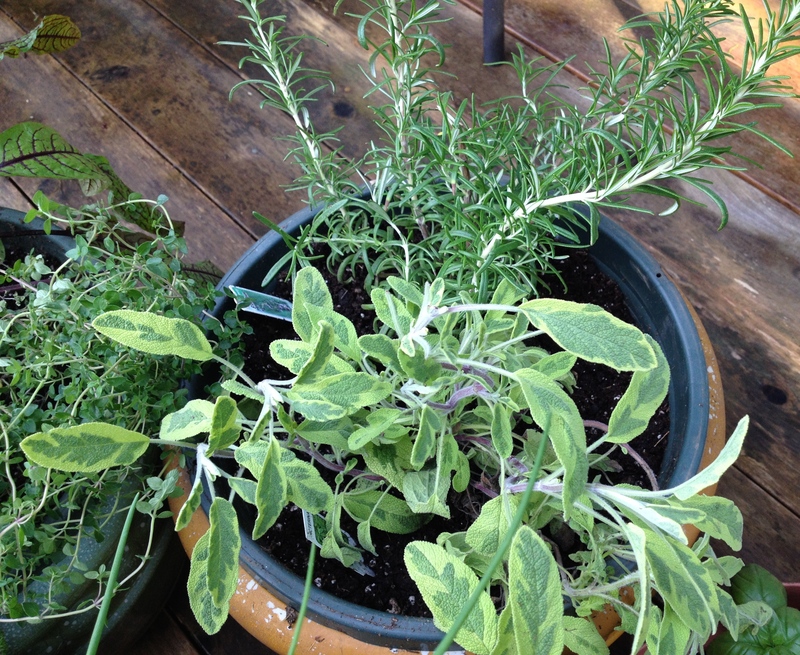 Toss with a little water, balsamic vinegar, and one of your favorite mixed herb season blends – like Spike or Mrs. 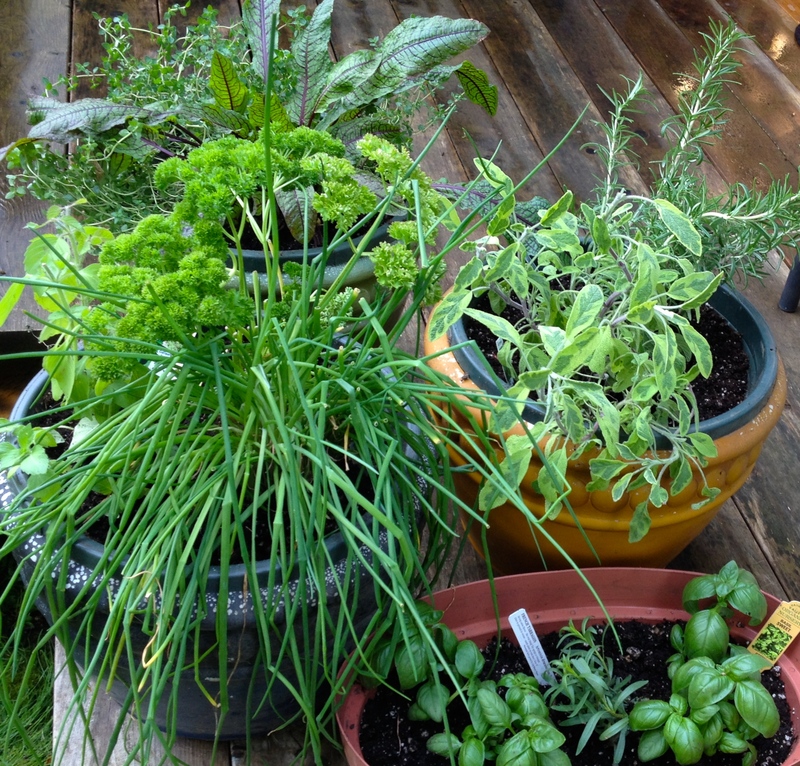 Dash – or reach into your cupboard for favorite dried herbs such as basil, oregano or rosemary. Take a blender and add your favorite spices and a handful of walnuts to your favorite vinegar. Brush it on the veggies frequently while grilling. (If you grill any starchy vegetables like potatoes, soak or marinate them first in a water-vinegar mix to add to their water content to minimize the production of acrylamide, which is a cooking-related carcinogen formed when starches are cooked at high temperatures.) 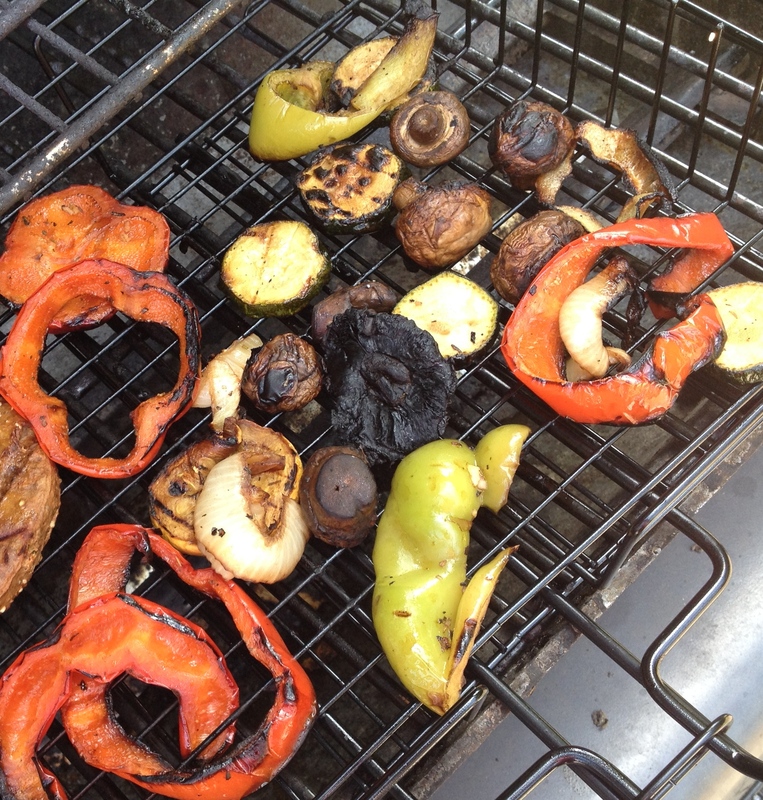 Also, it’s best to avoid grilling any type of your favorite food or veggies until they are blackened. So keep an eye on the grill. Once preheated, place the grilling tray or basket with your veggies onto the grill and monitor closely to prevent your veggies from burning. Grill over medium heat anywhere from 2 to 15 minutes or until crisp-tender, turning occasionally. 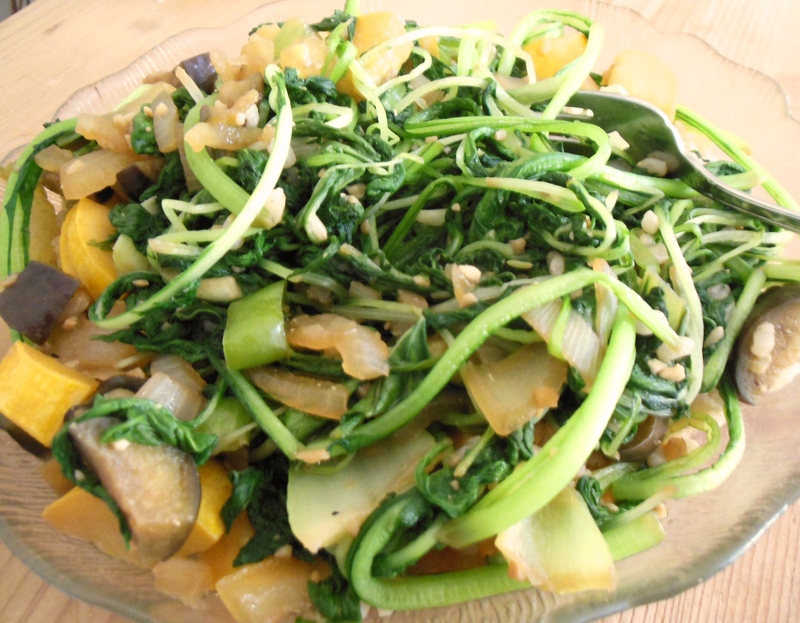 Some vegetables, such as thinly sliced onions or peppers, take a minute or two to cook, while dense vegetables like potatoes take longer, 10 to 15 minutes depending on the heat. 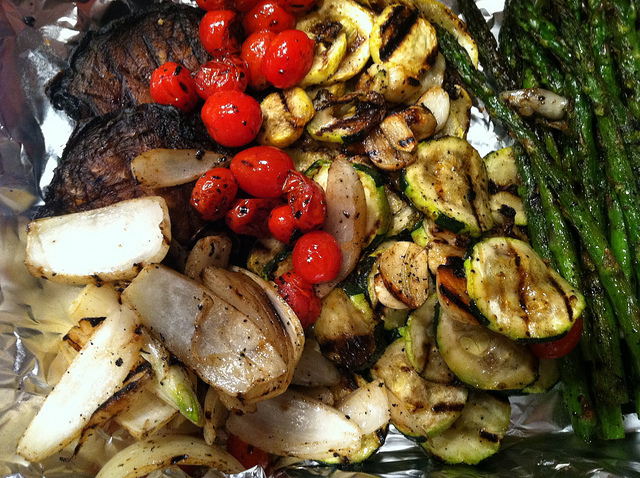 As my veggies grill up I move them over to a sheet of foil set up on a cooler section of the grill and wrap them up to keep them warm and ready to serve on a platter. Be sure to watch your veggies carefully. Grilling vegetables over too high a heat for too long will char them on the outside and they’ll stay raw on the inside. As an alternative to burgers, I love grilled portabella mushrooms marinated for 20 minutes in balsamic vinegar, grilled, and served with or without a toasted whole grain bun with sliced tomato, raw onion and all the trimmings. Try a pesto dressing made from basil, avocado and walnuts. Grill marinated mushrooms for approximately for 20 to 25 minutes, turning once. Remove from grill to a platter. Squeeze fresh lemon juice over mushrooms, and scatter on fresh sage or oregano. Serve hot or at room temperature. Another favorite is of mine? Grilled BBQ Tempeh! Cut the tempeh into ½ inch strips or into triangles – you have the option to cut the tempeh lengthwise to make it thinner, just keep a watch on the cooking time as this will cook faster. 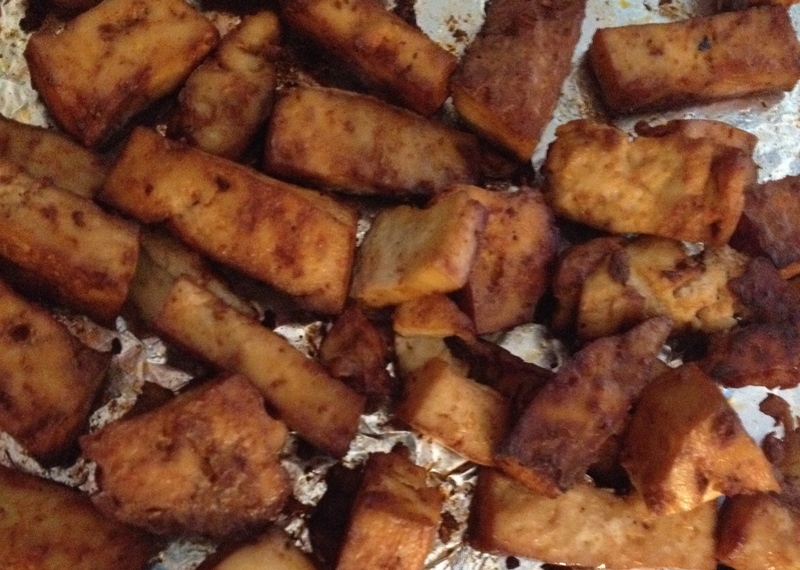 Place the tempeh into a baking dish and spread with a favorite seasoned vinegar or Annie’s BBQ sauce. Being careful not to break the tempeh, stir lightly to. Let them marinate for about 15 or 20 minutes. 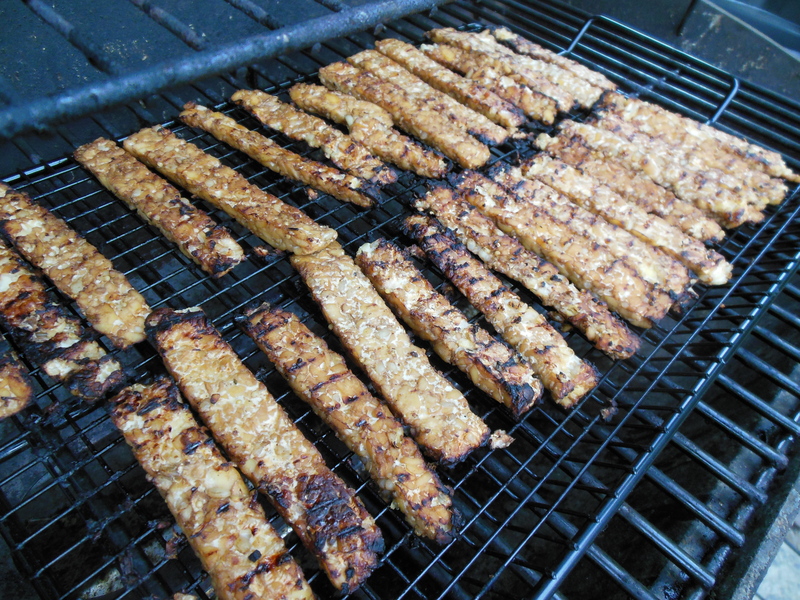 Cook the tempeh on grill pans for 4 to 5 minutes each side – turning carefully for even heating. Whatever you choose get out there and enjoy. Practice makes perfect. Whatever you choose to toss on the grill, you will become a grill master! Why Meatless Monday? 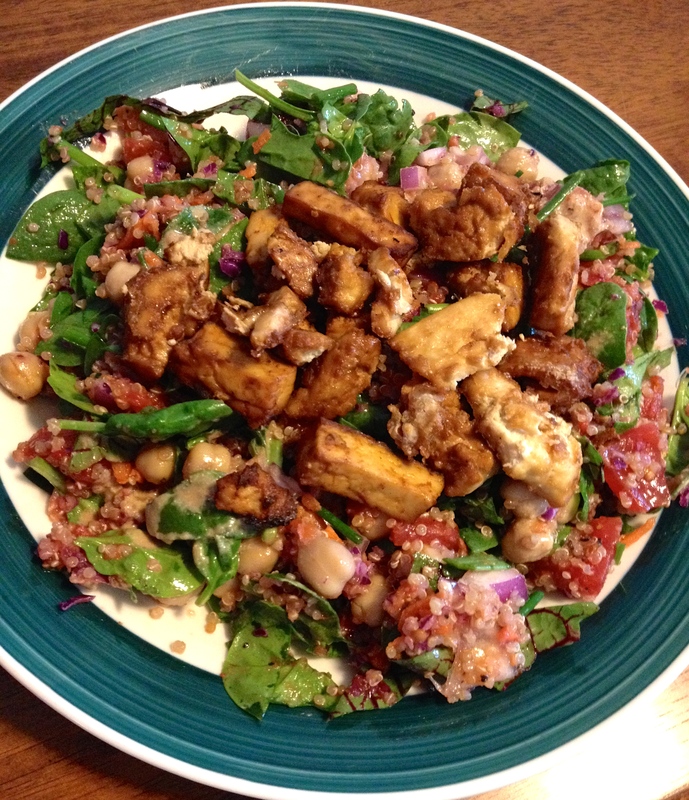 Try Easy Baked Tofu! 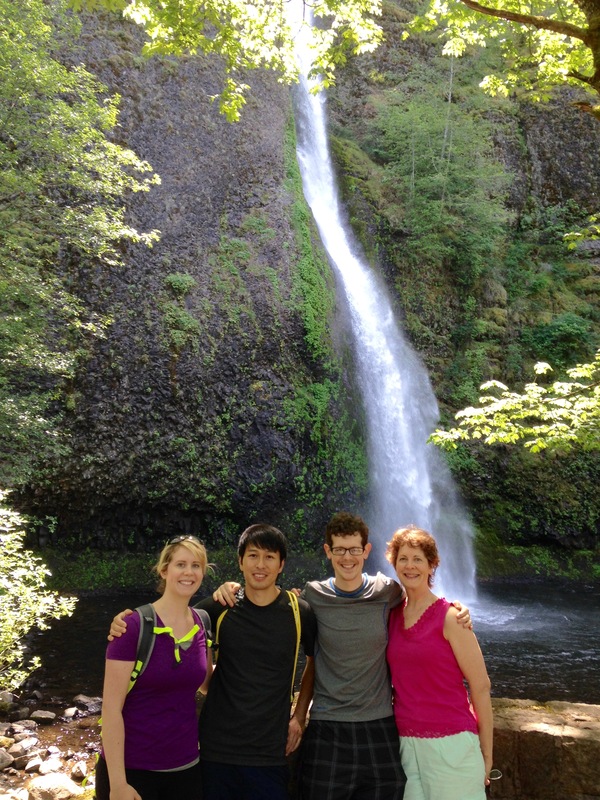 Over Mother’s Day Weekend, I spent some wonderful quality time with my beautiful family in Portland, OR where we got a chance to hike to Horsetail Falls. We are so blessed to live close to one another in one of the most beautiful areas of the United States. Nothing beats the beautiful outdoors of the Pacific Northwest! The entire family is excited to be living what feels to be the perfect life. We’re all striving to live a healthy lifestyle — we eat well, we exercise, we continue to learn new things, and we play hard. I don’t think anyone could ask for more. An average American eats an awful lot of meat, about 8 ounces per day. That’s 180 pounds a year, twice the amount Americans ate in 1960! 45% more than the USDA recommends. Research shows that a meat heavy diet can lead to higher body weight, obesity and eventually diabetes. Diets high in red and processed meats are likely to cause cancer, heart disease and stroke. Starting your week right, with a Meatless Monday, is a great way to change your mind and menu one step at a time. Every little bit helps. It helps your health. It helps the environment. Monday is the first day of the week, the perfect day to reevaluate your food and exercise choices and help you to set goals for healthier intentions for the rest of the week. One step at a time you will create a better future. If you’re worried about losing out on protein, don’t. You won’t suffer from protein deficiency because you go meatless one day each week. Besides there are some wonderful protein substitutions you can enjoy by adding protein rich beans, legumes, nuts and seeds (like quinoa) grains (like barley and bulgur) tofu, and tempeh. cut your weekly food budget. Now that’s pretty nice all the way around, don’t you agree? 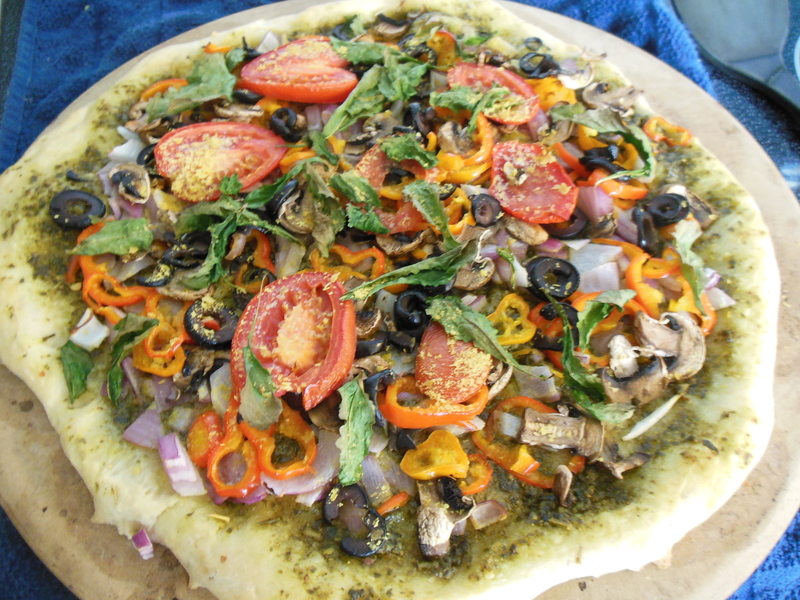 Several years ago, my family and I chose to move to a complete plant-based diet. We eat no animal products which includes no red or white meat, poultry, fish, eggs or dairy. For many, that’s too radical of a change and most people are not ready to take that big of step. But I hope to change your mind and menu for at least Mondays. Going meatless one day a week isn’t hard. Every small change will make an impact on your health. 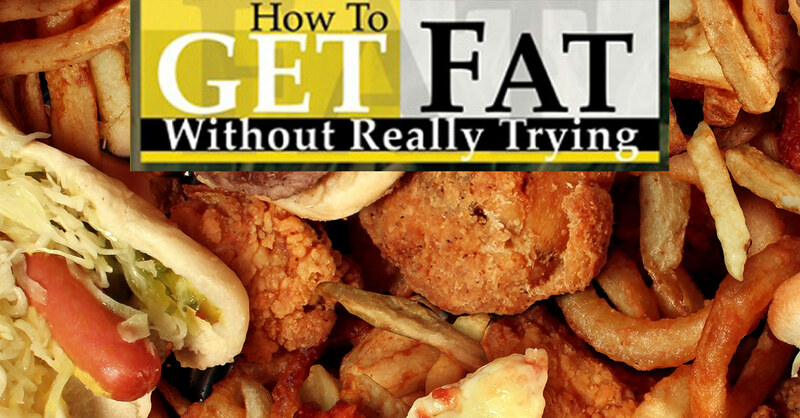 And it will can encourage you to try foods you might otherwise pass up in favor of a burger or steak. If everyone in the U.S. ate meatless just one day per week – at home, at work, at school, at restaurants it would make a huge impact on their health and on our environment. So in the spirit of Meatless Monday, here’s a great recipe for Easy Baked Tofu that I find very delicious and easy to put together. You can’t beat that, because let’s face it, Mondays can sometimes be hectic. If you’re prepared with menu ideas that aren’t difficult to make and are satisfying, you’ll be more likely to give it a try! Now I know some people who absolutely hate tofu. Although it’s been around for centuries, sadly it’s gotten a pretty bad reputation because it looks funny, has a funny texture and basically has no flavor. There are a lot of reasons why people say they hate tofu, but I feel that can be avoided when tofu is prepared and cooked properly. I enjoy tofu scrambled with veggies and use it to make sauces. But, I think my favorite is baked tofu. It’s great when warm, and makes a great, easy-to-transport snack to eat on a long hike, between classes, or your commute home. I like to marinate my tofu, and often use Tamari Sauce. A while ago, I tried adding Annie’s Organic BBQ sauce. On my recent trip to Portland, I shared some with my 24-year-old son who loved it. Being a busy full-time student at PSU, who also works half-time at OHSU, he’s always looking for quick and easy, tasty recipes. The key to this recipe is just a few hours of time to marinate the tofu or prep the night before. Prep time: 30 minutes to press the tofu, a few hours to marinate or overnight. Take the extra-firm tofu, wrap it in a paper towel and press it beneath a weighted plate for about 30 minutes to remove the excess water. Next, cut the tofu into one-half inch cubes, slices, or sticks and place into a glass dish. In a shallow dish, whisk together the Tamari sauce, water and BBQ sauce. Pour the sauce over the tofu being sure to drench each piece. Cover with plastic wrap and place in fridge to marinate for a few hours or overnight. When ready to bake, preheat oven at 400 degrees. Spray a baking sheet with nonstick cooking spray (I use my Misto oil sprayer). Lay the tofu on the baking sheet and spray with a bit of oil. Bake for 12 minutes, flip each piece and continue to bake for additional 12 to 15 minutes until puffed and golden. When done baking, add to your meal. It’s great in salads, stir fry, rice bowls, sandwiches, and crumbling into sauces served over pasta. Pack what doesn’t get eaten for later in the week. Sorry I’ve not posted for a few weeks. For the past two months I’ve been suffering from some pain in my right shoulder that radiated down into my right arm, along with some numbness and weakness in my right hand. And so working at a keyboard was a task that was, unfortunately, inflaming the condition. I’m happy to say that after easing up on keyboard typing at home, along with: acupuncture, chiropractic therapy, making major changes at workstation at my day job, working on exercises, and using a combination of Turmeric (Curcumin ia a key chemical in turmeric that reduces pain and inflammation) and Bromelain, (a protein extract derived from pineapple that reduces pain and swelling) to help reduce the inflammation — (instead of ibuprofen, which causes me stomach pain) it has all finally helped me to move toward recovering and feeling better. I’m not totally pain or numb free, but I’m getting there! Dealing with pain is just plain hard. It makes it hard to think, to do the easiest tasks, to keep up with exercise, to eat well — all things that are important to do so your body can heal and you can get well. These past several weeks, I’ve kept up my exercise regime; and in the food arena, I feel I’ve kept up with eating healthy. I pulled out a lot of my pre-made soups and chilies from the freezer. And to help with eating fresh, I picked up some prepackaged things like bags of prechopped coleslaw, broccoli slaw, and prewashed greens — I love the BIG $5 bag of organic kale that my local Safeway offers! Whenever I make a smoothie, I make a triple batch and pop individual servings into the freezer. So, I kept up with that. Being prepared is always a great way for me to go, especially when I need to grab something quick before heading out the door for work or for a rehearsal like I’m doing now for Les Misérables at Cottage Theatre. That’s right! We are rehearsing for Les Mis which opens April 10! You don’t want to miss this fantastic show. Tickets, which go on sale March 10th, will sell FAST; so I’ve set up an easy link for you to click here for tickets! So now for the fun part of this post! 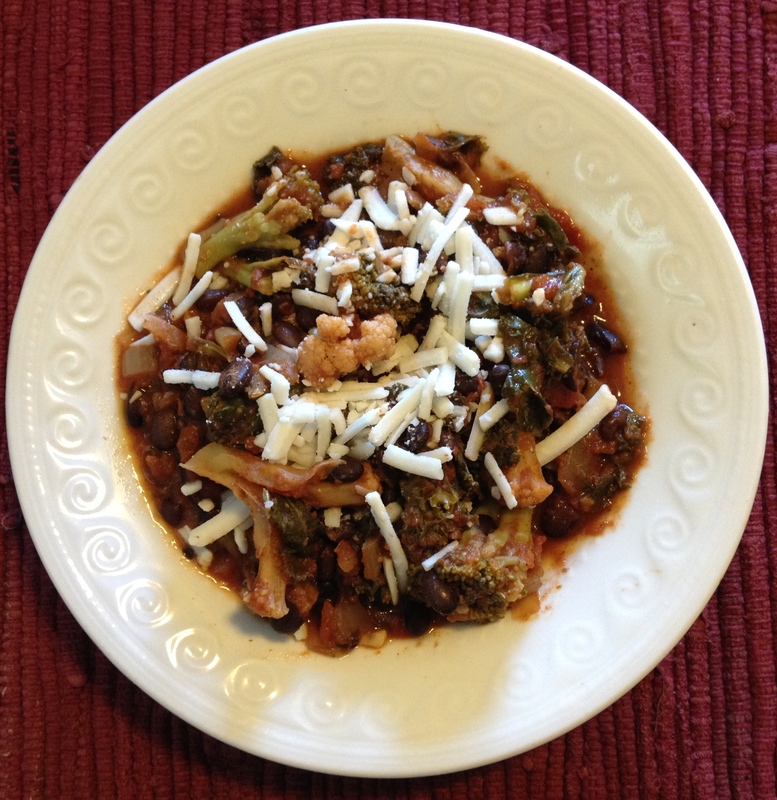 Here’s one of the simple meals I cooked up to help me eat up my BIG bag of kale. 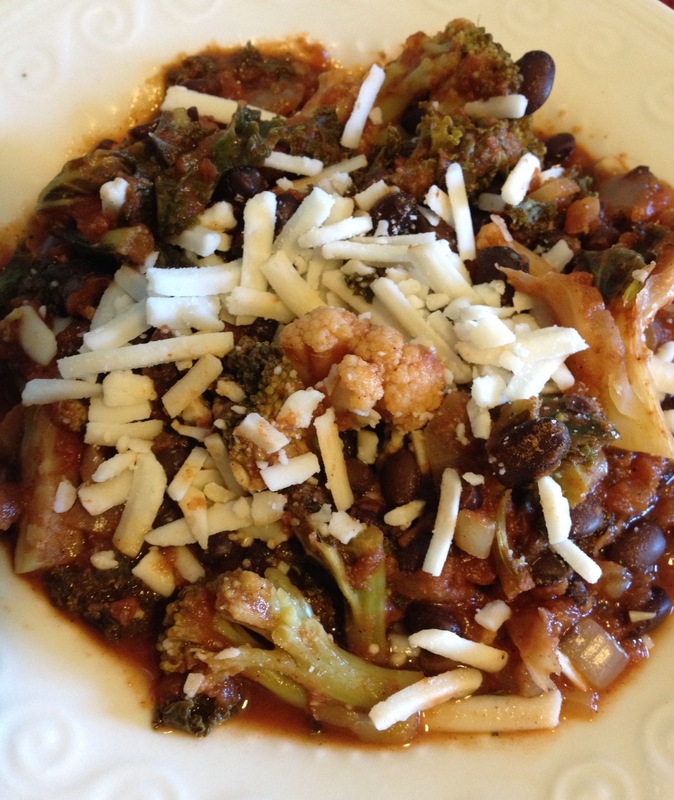 It’s a delicious, meatless chili with black beans, broccoli, cauliflower, mushrooms and of course kale. It’s so easy to make. Every ingredient is packed with nutrition, the meal leaves you completely satisfied and it’s also easy to freeze in individual servings for lunch at work or when you don’t have an hour to prepare a home-cooked meal. 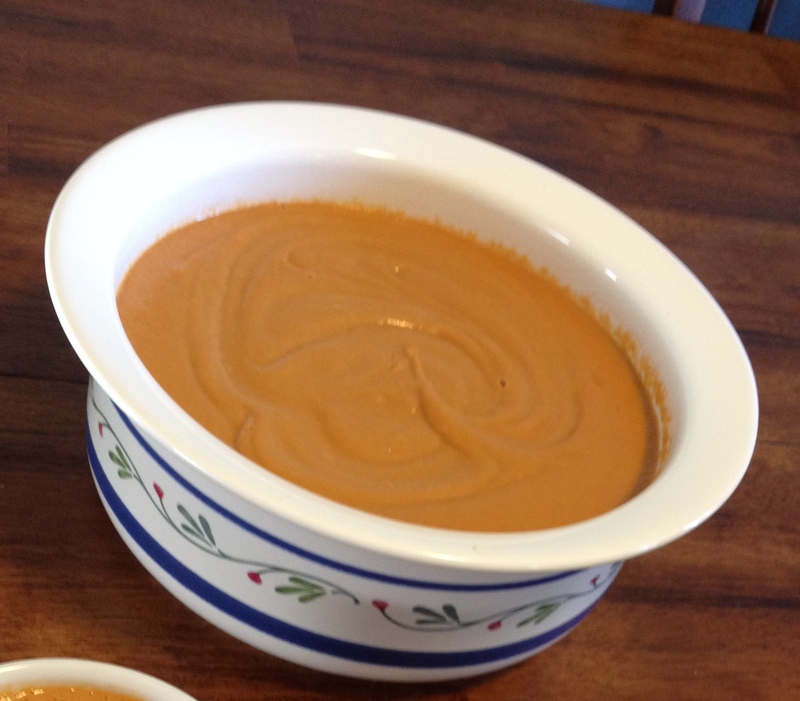 In a 3-quart saucepan, heat the tamari sauce with about a tablespoon of water. Add onion and cook over medium heat until softened, add mushrooms, a bit more water and saute about 4 minutes. Add garlic and cook for an additional one minute. Add chili powder and ground cumin. Stir until blended and fragrant. Add tomatoes and tomato paste, stir well and simmer for about 5 minutes, stirring occasionally. 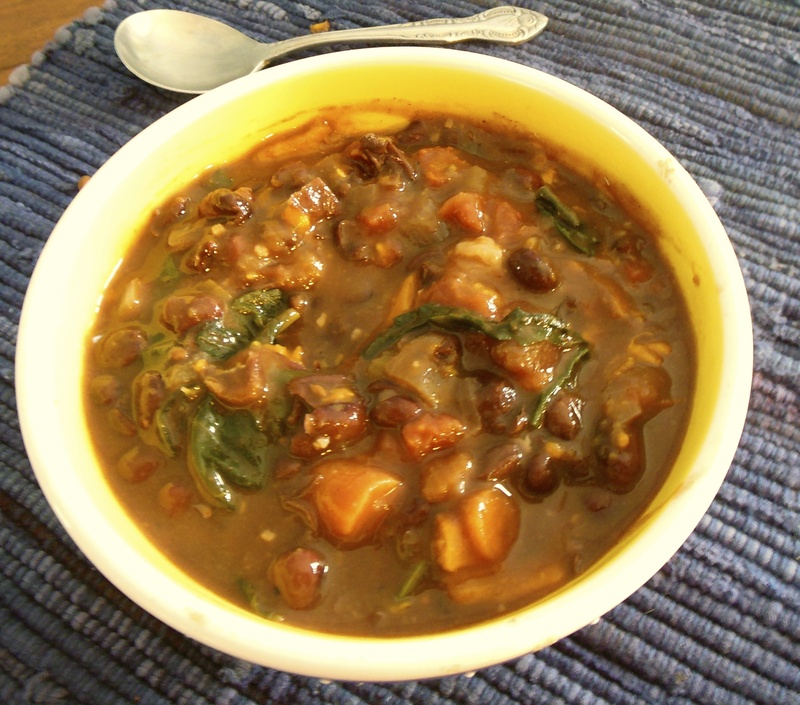 Gently stir in the black beans, the nutrition yeast and blend with sauce. 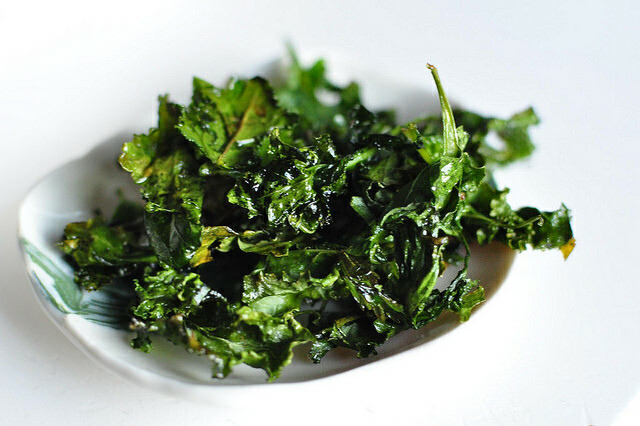 Next, add the kale and stir until it starts to wilt. Last, add the broccoli and cauliflower and cook for about 15 more minutes or until broccoli and cauliflower are tender. Serve in bowls as is or with a favorite garnish; such as, grated non-dairy cheese, non-dairy sour cream, toasted pepitas, chopped green onions, avocado or cilantro. 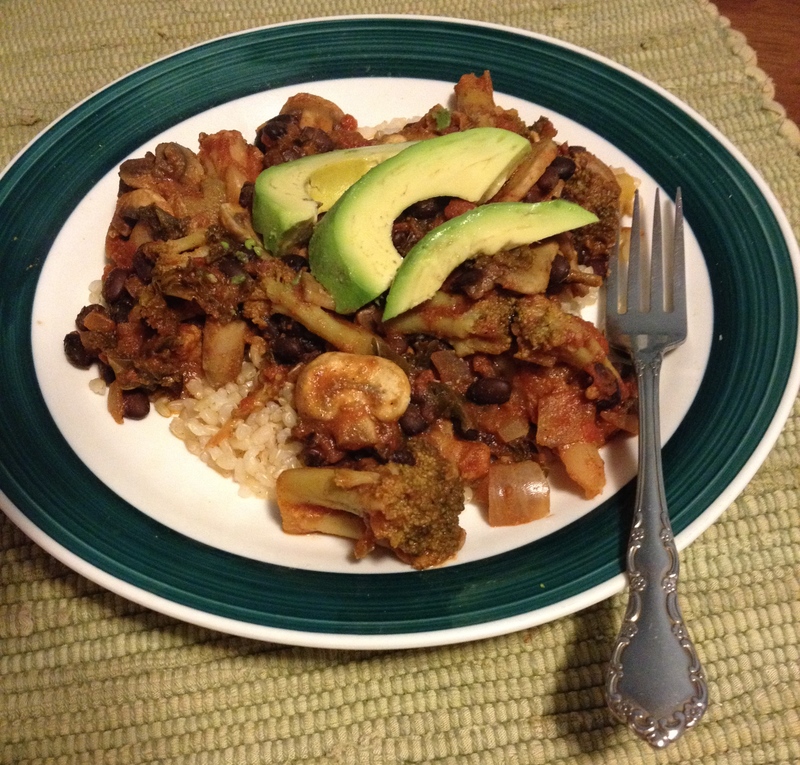 This meal would also be wonderful served over ½ cup quinoa or brown rice. 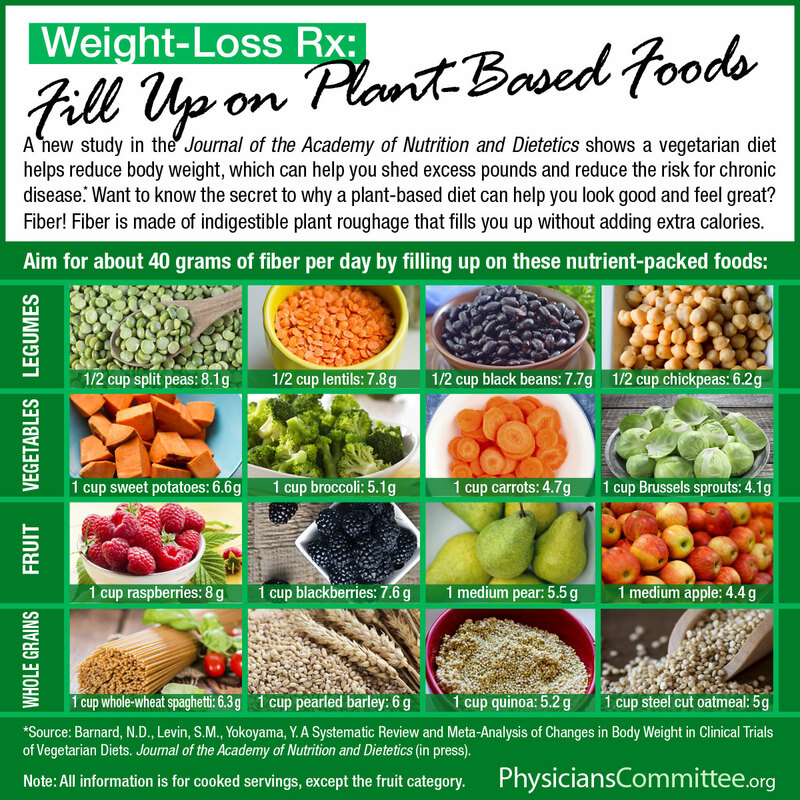 According to a new online advance meta-analysis published on Thursday, January 22, 2015, in the Journal of the Academy of Nutrition and Dietetics, the Physicians Committee recommends consuming close to 40 grams of fiber a day as a secret to losing weight on a plant-based diet. It’s easy to do when vegetables, fruits, whole grains, legumes, nuts and seeds become the center stage of your plate! So keep your promise to feel your best in 2015! Go Plant-Based! 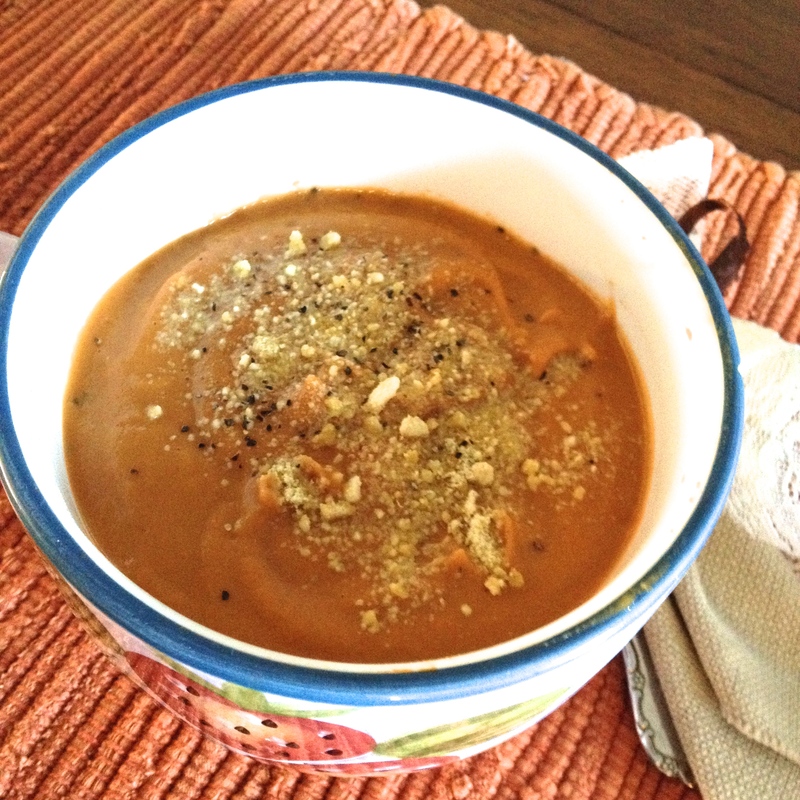 This satisfying soup is very thick and creamy – just the way I like it! It’s especially yummy on a cold winter day, incredibly easy to make, and quick to come together. You can whip it up on a busy weeknight, for the family. Or if guests drop in unexpectedly, it’s a snap. If you own a Vitamix, once it’s going in the blender, you don’t need to constantly stand over it. Once the ingredients are blending it only take about 10 minutes to heat. If you don’t have a Vitamix, simply transfer from your blender to a pot and heat over medium heat on the stove until piping hot. Once it begins to heat start fixing your salad, come back and stir once in a while; and in no time – it’s dinner! Since I like to be prepared for the week, I’ll cook up a batch on weekend for extra fast weeknight dinners. The soup keeps well in the refrigerator. It’s easy to set up for no-fuss lunches – and freezes very well too. I’ve a few servings the freezer right now. In a medium pan, saute onion, garlic and carrots in tamari sauce and 2 – 3 tablespoons of the vegetable broth for about 3 minutes. 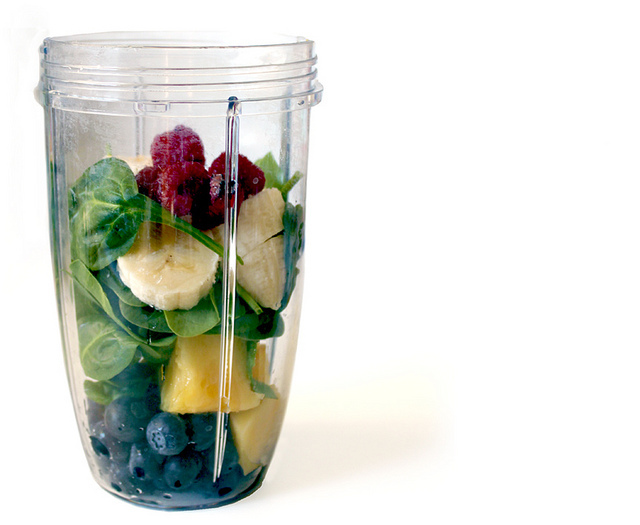 Place all ingredients into a high-speed blender. 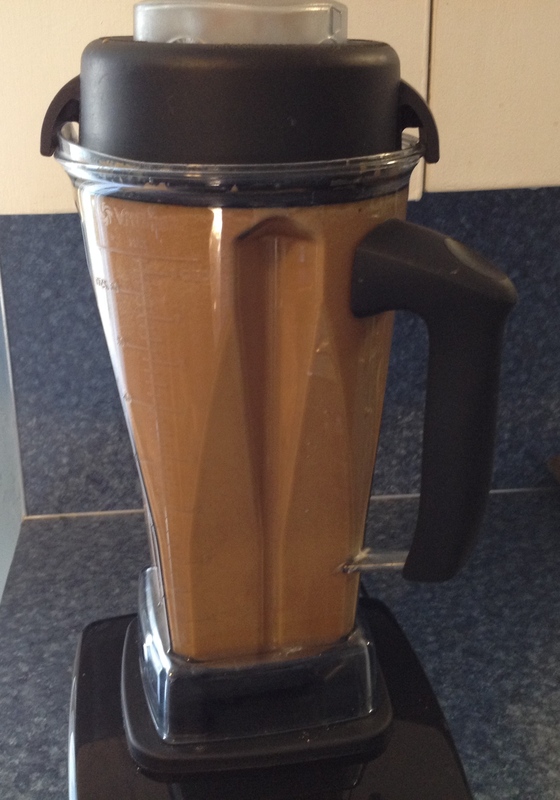 I used my 8 cup Vitamix and the container was very full. If you own a Vitamix, blend for about 10 minutes and serve piping hot from the blender. If not, after blending up all the ingredients transfer into a pot and heat over medium heat on the stove until piping hot. Serve plain, with a sprinkle of black pepper and a garnish of Cashew Parmesan Cheese. A chiffonade of basil looks pretty when serving to guests! *I’ve been asked why I use tamari sauce to saute. With some added vegetable broth or water, it’s a great flavor and way fewer calories than sauteing with oil. Japanese tamari is thicker, darker, richer and less salty than soy sauce.